"I don't get a good night's sleep" - the common cry of the busy, the worried or the anxious and something we hear very often from our clients. We adapt and even cope quite well despite interrupted sleep patterns but are we aware of the short fuse it puts us on, or the impact on our capacity to deal with anything extra? I'm often reminded of the school teacher who told us her story about her unruly class. 'The thing is,' she said 'there are days when they behave perfectly. Then there are other days when they play me up and we don't seem to get anything done. And how do they know to push my buttons just when I feel at my lowest ebb?' She was so worried about this she kept a log of what was happening and lo and behold, discovered the class always behaved badly on the day after she had a bad night's sleep. She paid attention to what happened when she was tired and decided to do something to change her habits - especially before weekdays. She's had much better behaved classes ever since! There is plentiful advice about creating a lifestyle that encourages you to sleep well. And more about how to cope when you have irregular or unsocial work hours. But what if your problem is simply that you struggle to drop off even though the conditions are just right? I grew up with a mother who could sleep for Britain and with her as a role model developed a strong belief that sleep is just one of those things that happen naturally. My head would hit the pillow and within moments I was off in the land of Nod. To the annoyance of other family members I always woke up refreshed and with plenty of energy for the coming day. When my children came along I learnt the art of cat-napping - and soon found I could wake up refreshed after a half hour zizz on the sofa. I hardly noticed that other folk didn't have this wonderful 'sleep gene,' though I've always felt blessed with a good share of energy. Unfortunately things changed around the time of the menopause. The hormonal trigger was, I'm sure, only part of it. I also seemed to have lost my 'worry off' switch and found myself going over things I needed to do, decisions I wasn't sure about and endless ideas that needed attention. There is an NLP technique called 'modelling' which is a way of working out the beliefs which underpin a skill and the steps that are essential to making it work well. We use modelling to learn how a client 'does' their problem and help them work out how to change, or to model something more resourceful which they might want to enhance. As we talked to our clients about their sleepless nights, I shared with them my strategy for successful catnaps. This was something I had modelled many years earlier. Just recently I asked myself why wasn't I using that same strategy to ensure a good night's sleep now? There is no rational answer to this! I guess I just didn't see the wood for the trees! I enhanced my model with another little skill I have which is an unconscious awareness of time and a couple of other tricks I've learnt. I have been using my new super-strategy for a month now - and guess what, I'm sleeping much better again. I think about when I want to wake up and calculate how many hours sleep that gives me - I usually aim for between 7 and 8 hours - to the nearest 1/4 hour. "I'm going to SLEEP now for 7 3/4 hours and I want to wake up at 7.00 refreshed." I might repeat the word 'SLEEP' in my head a couple of times. 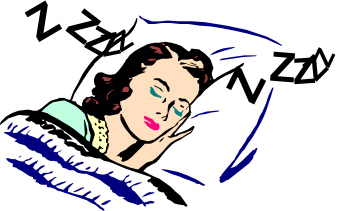 If any other thought creeps in, I banish it with an internal command tone 'SLEEP'. I don't know what happens now till I wake up! I very often wake up once or twice in the night and use the bathroom. When I get back to bed I repeat the process - recalculating the time I have left. In the morning I find I wake up pretty close to my set time. I get up. Allowing myself to drop back off to sleep often robs me of that 'refreshed' feeling. After all I can always have a quick power nap later. As I wake up I say an internal 'Thank you.' This is very important. I have a strong belief this works because I believe it works. This is even more important! It was the success of my cat-napping strategy that convinced me. I'd love to hear if this works for you and any variations you might have on this theme.